For hunters looking for a compact optic that is perfect for outings where packing light is essential, Nikon’s ACULON A30 10x25 roof prism binocular provides smooth central focus knob, multilayer lens coatings and dual-hinge design that allows it to fold-up and fit in a pocket. 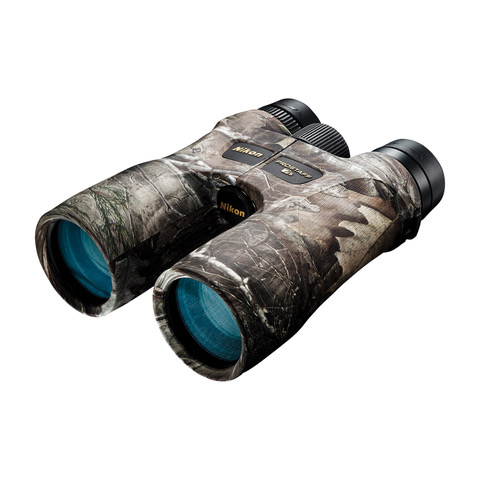 In TrueTimber Kanati, the ACULON A30 is also an ideal binocular for turkey, waterfowl and bow hunting. In a full-sized hunting binocular, Nikon’s PROSTAFF 7S 10x42 was selected for its field-worthy performance resulting from a fully multicoated optical system and phase-correction coated prisms that deliver sharp images with superior resolution and clarity. It is nitrogen filled and O-ring sealed for waterproof/fogproof performance. The new PROSTAFF P3 MUZZLELOADER 3-9x40 in Kanati is not only handsome, it also makes 300-yard shots a reality for today’s inline muzzleloader rifles. Its proprietary BDC 300 reticle can be fully optimized for customized “aiming points” at different yardages using virtually any muzzleloading sabot and Nikon Spot On Ballistic Match Technology. Fully multicoated optics provide a bright, clear sight picture from dawn until dusk. Shockproof, waterproof and fogproof with durable aluminum turret caps, zoom control and quick-focus eyepiece, the PROSTAFF P3 MUZZLELOADER is built for a lifetime of rugged performance. Nikon Inc. is the U.S. distributor of Nikon sports and recreational optics, world-renowned Nikon 35mm cameras, digital cameras, speedlights and accessories, Nikkor lenses and electronic imaging products. More information can be found at NikonSportOptics.com.